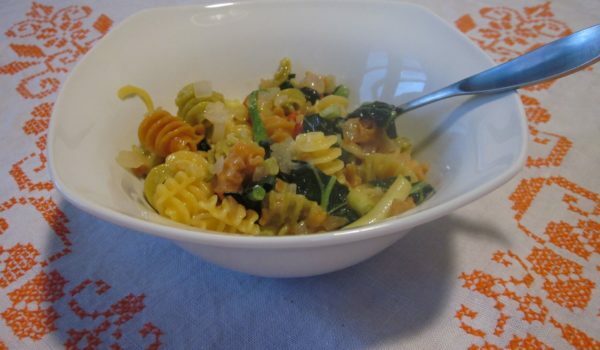 When I’m looking for a quick and easy pasta dish, I whip up a variation of this summer pasta and veggies. It’s a great and quick dinner idea that is flexible enough to work with what you have in the kitchen. The main concept is warm pasta, olive oil and cheese. The cheese should be something like a soft cheddar. Mozzarella works too, although is softer and thus gooier. The olive oil and melting cheese make a light enough “sauce” that works well with the pasta. A dash of sea salt, and you’re all set. The variation comes with veggies you have on hand. You can stop at the pasta, cheese and sea salt, or you can spice things up by sauteing up some veggies to stir in as well. Today I had onion, kale, red bell pepper and green beans on hand. First cook the pasta according to the box’s directions. Drain the pasta. Transfer the pasta back to the pan and pour a little olive oil to coat the pasta so it doesn’t stick to the pan. Next you’ll want to saute up some fresh veggies. Finely chop the red pepper and onion. Cut the green beans into 1-inch bites. Grate the cheese (or cheeses) of your choice. I eyeball the amount. Depending on how cheesy you want it will determine how much you grate. Grate a handful, and then you can always add more depending on the results. Heat a small skillet with some olive oil. Once warm, toss in the onions and red peppers. Once the onions have started to turn golden, add the green beans. After about 5 minutes, add the kale. Cook until the kale softens. Add the grated cheese to the pasta in the pan. The heat of the pan and pasta will help melt the cheese down. Stir frequently to mix the pasta and cheese together. Toss the sauteed vegetables into the pot and mix thoroughly. And now sit down to enjoy this delicious meal! Season as desired. Variations: Try other summer vegetables and seasonings to mix things up.